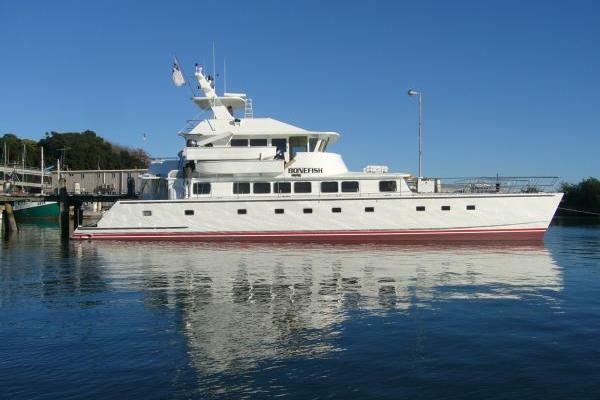 Built by New Zealand skilled craftsmen, "Bonefish" is an extremely strong, fuel efficient vessel constructed to very high structural standards of Det Norske Veritas Rules for High Speed and Light Craft Classification 1A1 HSLC RO YACHT. Complete structural engineering was accomplished by High Modulus New Zealand Ltd., a world-recognized leader in composite design. 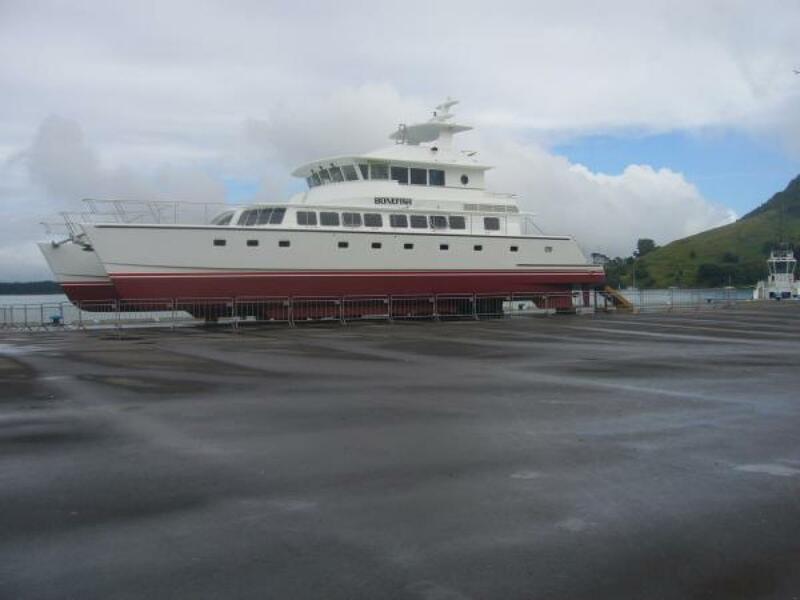 Even a cursory inspection reveals not only meticulous attention to detail, but that of a vessel readily adaptable to a variety of purposes, from private exploratory cruising to commercial operations. The broad 36' beam provides interior accommodations equal to a 120' monohull, but even greater deck space than typical vessels of that length. The wide beam also provides steady comfort at sea without need of stabilizers, as well as excellent handling characteristics due to the 8.5 meter separation between engine centers of thrust. Four deck levels, three cockpits and twin boarding platforms all contribute to a sense of spaciousness as well as to beautifully proportioned lines. Entry is gained via port and starboard boarding platforms leading through sliding transom doors to the main (lower aft) entry deck. 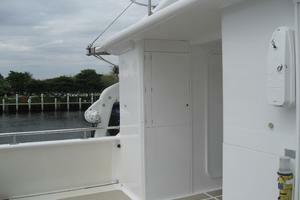 Entry access is enclosed on three sides and further protected by an elevator holding one 16' tender aft of the transom. 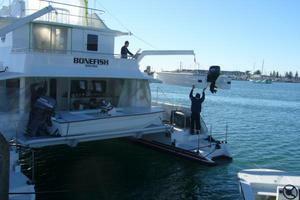 Launching the tender frees up the elevator for use as a diving or fishing deck while at anchor. Swim steps are incorporated into aft extensions of both boarding platforms. 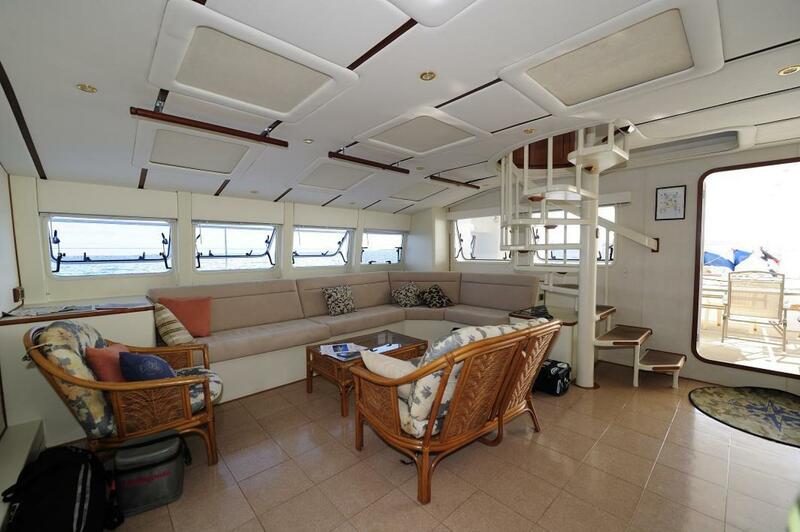 The first impression upon entering the lower deck is that of a large secure space perfect for outdoor entertainment, having ample room for BBQ, dining, lounging, fishing or sundry other activities. To go inside, one proceeds through double glass entry doors which are enhanced by a decorative column feature that replicates larger transom columns supporting overhead structure. 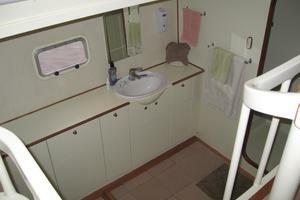 Portside is a fully functional powder room with toilet and shower. 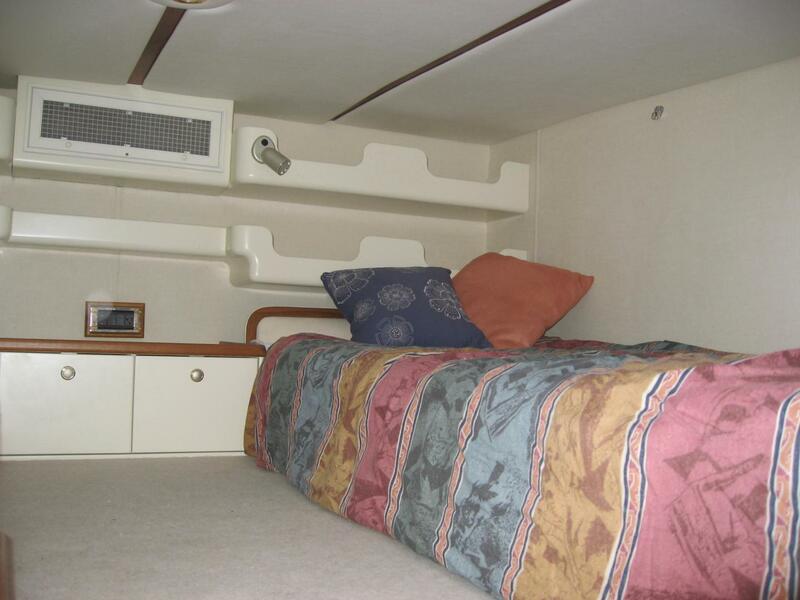 Additional open showers are conveniently recessed into coaming just outside the transom doors, and nearby are racks to dry fishing boots or land wear. 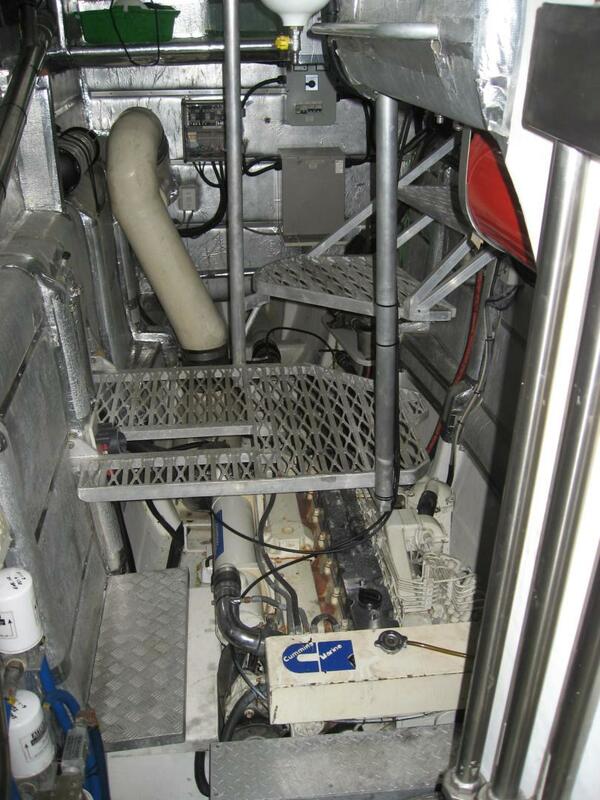 Two weather-tight doors allow protected access into sound insulated engine rooms outboard. Proceeding through the double entry doors into the salon, one's attention is simultaneously taken by a graceful spiral staircase reaching to the upper levels, and by a huge 16' L-shaped settee backed by large windows outboard and aft. Looking forward one sees an over-sized bulkhead passageway opening into the dining room and visible beyond is another series of large windows athwart-ships. 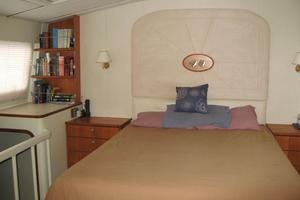 Immediately off the entry foyer to port is an angled door leading into the master stateroom. Wall coverings throughout are textured vinyl in neutral ivory beige color contrasted with teak trim and dark mahogany safety handrails on the wall and ceiling. 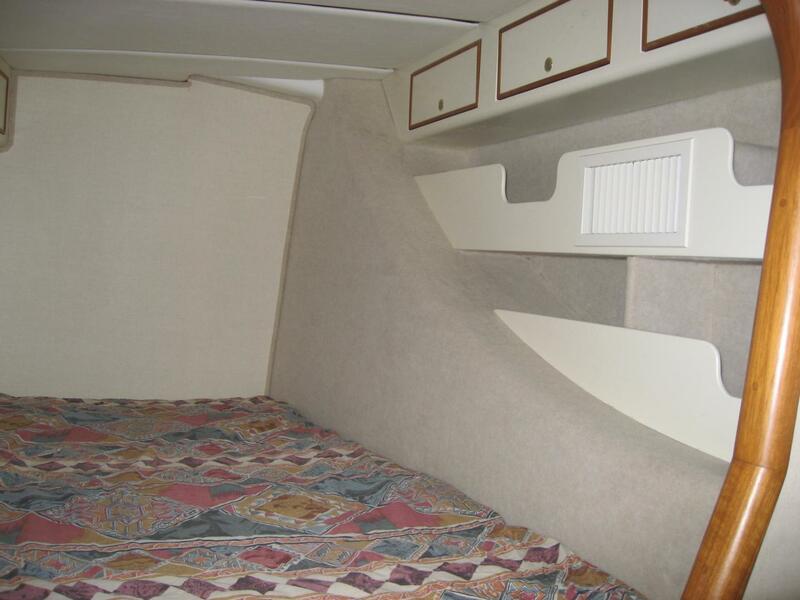 The ceiling pattern is a unique combination of white marine padded vinyl, mahogany battons, beige micro-suede inserts and both indirect and recessed lighting. Floor treatment throughout is beveled-edge cork tile custom stained to complement the neutral decor and sealed with several coats of clear semi-gloss polyurethane finish. Ample wall space is available for artwork and/or entertainment preferences.The prevailing ambiance is open plan with abundant natural light and ventilation, one that is readily amenable to a future owner's personal imprints. 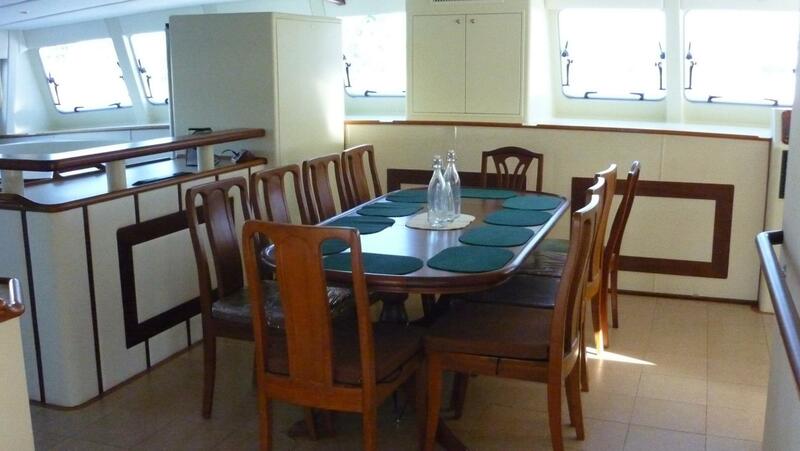 Occupying the forward center of the main deck, the dining room is separated from the galley by an attractive island bar in solid mahogany and padded vinyl. Seating for 10 or more is provided in solid teak chairs surrounding a custom mahogany table, with generous access for all to adjacent buffet counters. Large windows provide nearly a panoramic view forward, supplemented by outboard windows on both sides. Again the ambiance is dominated by earth tones and natural light, creating a comfortable open air atmosphere. 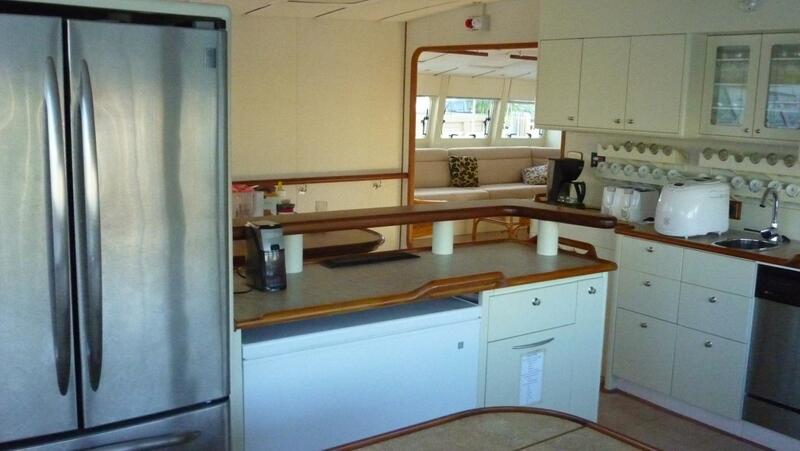 The all electric Galley is to port on the main deck, semi-open to the dining area and features a built-in dinette with seating for 3 or 4. The twenty-four (24) linear feet of available counter space is basically L-shaped, with the island bar off one side of the "L". 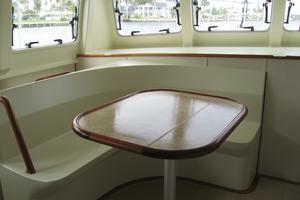 Counter tops are hard wearing laminates trimmed in teak fiddles incorporating safety hand holds. Equipment is logically arranged for efficient food preparation. 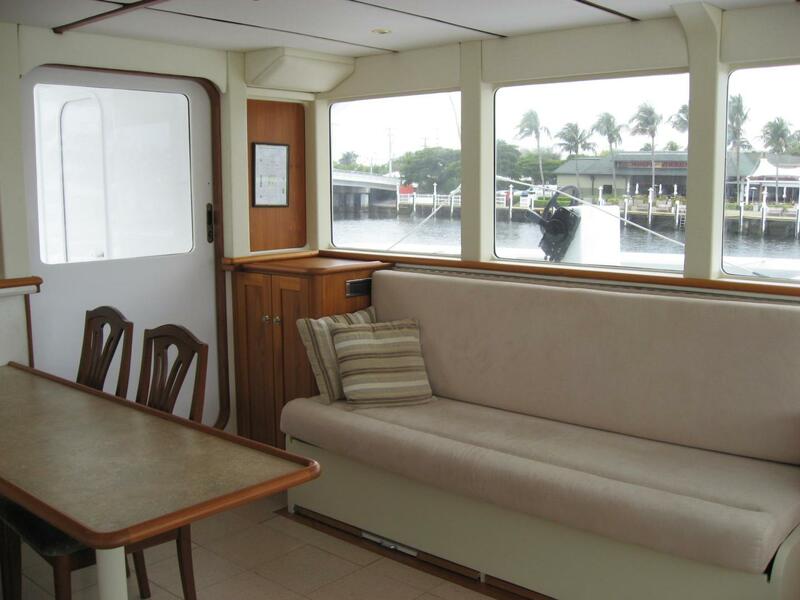 Large opening windows outboard and forward provide excellent natural light and ventilation. Appliances are stainless with black accents. 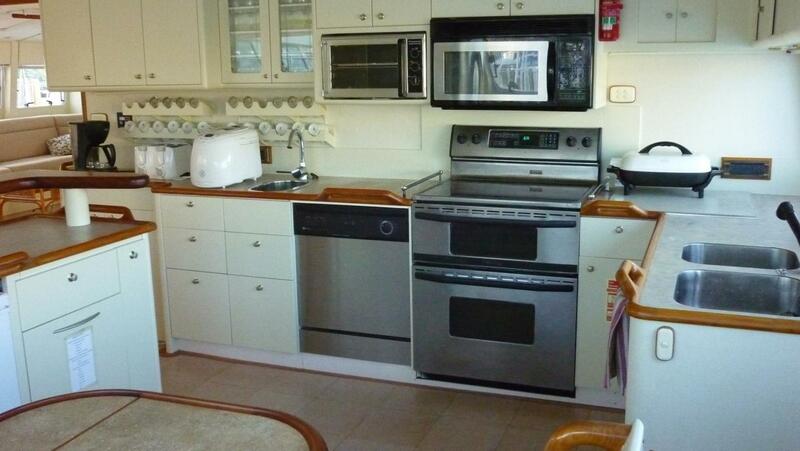 The glass-ceramic top Maytag range has two (2) ovens below and a microwave above. 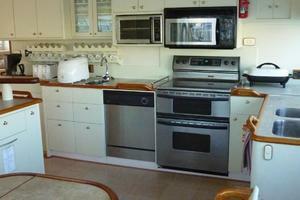 A separate Toastmaster convection oven is located above the Maytag dishwasher. A GE Profile refrigerator has side by side doors above a pull-out freezer drawer below. 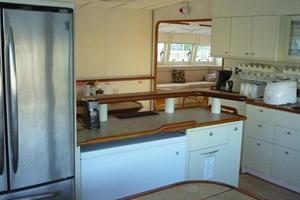 A separate freezer is built into the island bar, which has a hinged top for access. 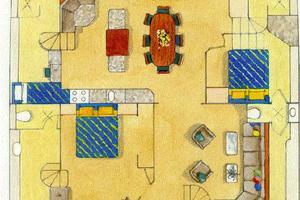 BONEFISH sleeps 14 in 6 cabins. 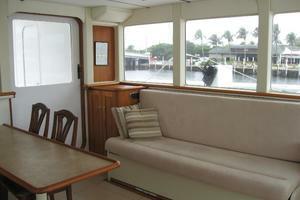 The total number of berths is 12, consisting of 2 double berths and 10 single berths. 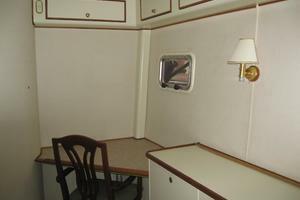 The layout has the flexibility to designate certain cabins to be either crew or guest. Depending on owner preference or mission requirements, crew could be assigned either 2, 4, or 6 berths in cabins separate from remaining guest accommodations. Entrance to the master cabin is through a door set 45 degrees into the entry foyer. Centered inside is a queen-size bed, bracketed by two (2) nightstands, oriented fore and aft with storage drawers underneath. Inboard is a double wardrobe. 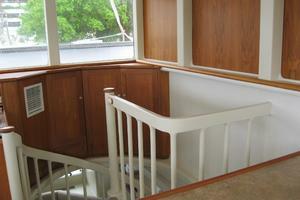 Outboard and down a few steps is a large dressing area with toilet and shower compartment. Large opening port lights and recessed lighting illuminate a long bank of cabinets and drawers. 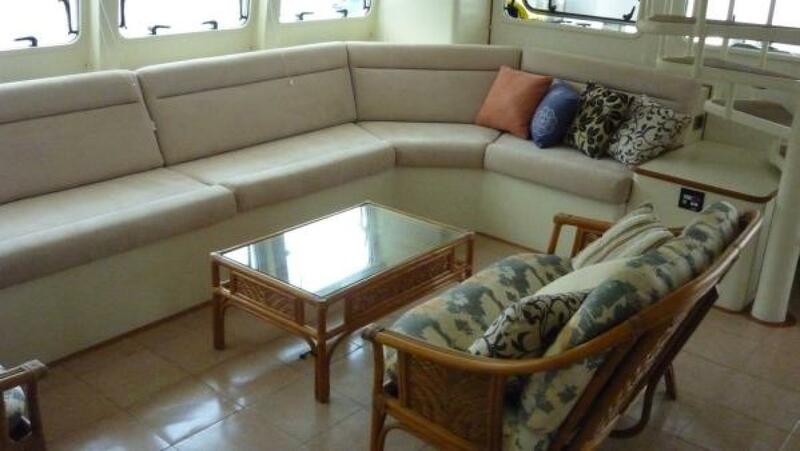 Completing this arrangement on the main deck is a built in settee. 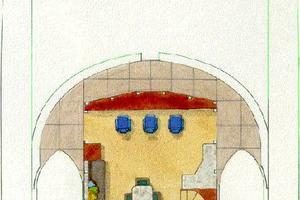 Above the dressing area and inboard is an easy chair and glass top table. Outboard above the dressing area are four (4) large opening windows with privacy blinds. 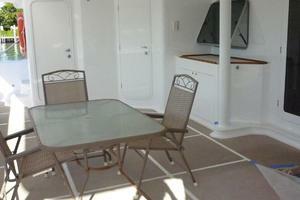 Aft is a doorway leading into powder room which is also accessible from the deck. Another large opening window facing aft provides additional natural light and good cross ventilation. 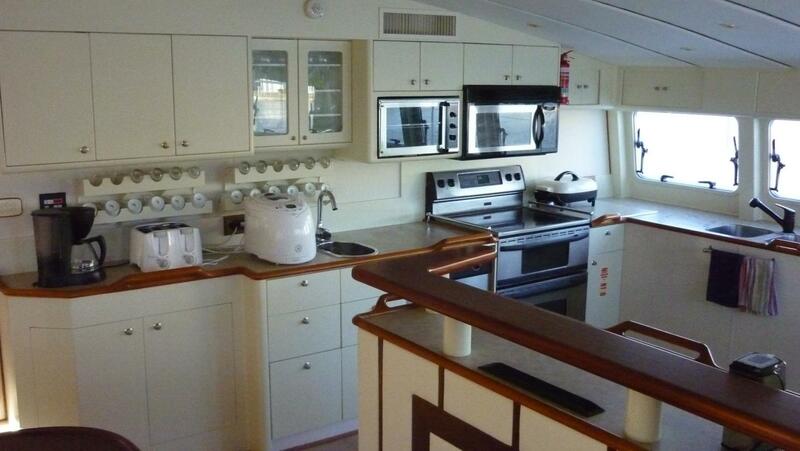 Port and starboard guest cabins are mirror images of one another. 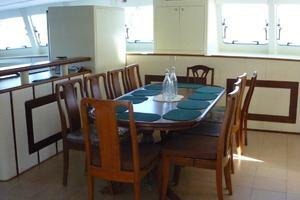 The port guest cabin is accessed from a curving staircase leading down from the galley, the starboard cabin from the dining room. 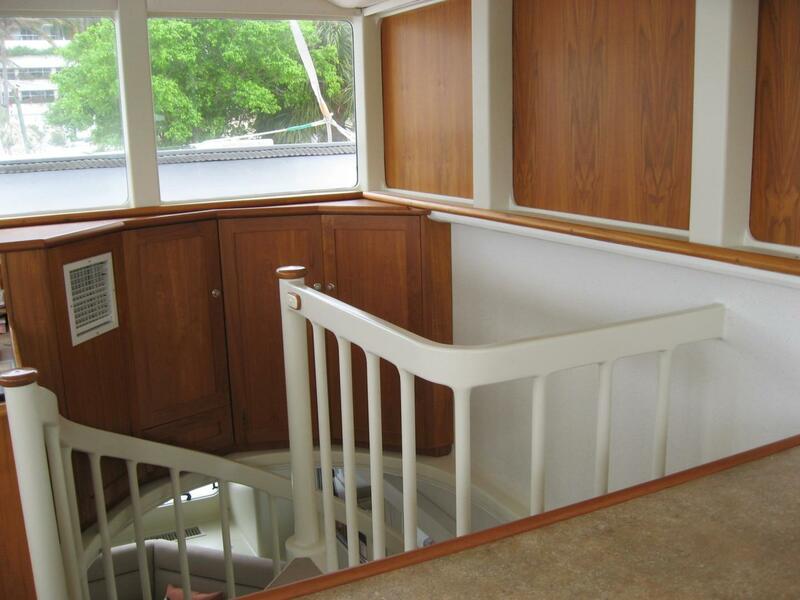 A short companionway connects to the guest cabins which feature fore and aft berths recessed in the forward hulls. 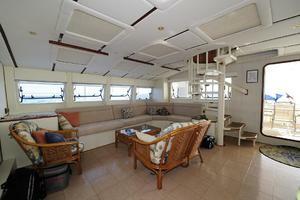 Immediately aft and inboard are two single berths situated on the bridge deck a half level above the cabin sole. Two outboard port lights, one inboard hatch and one large overhead hatch provide natural ventilation and relieve any feeling of being closed in. 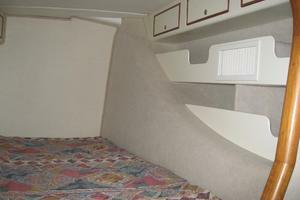 Storage for bags and gear is provided under the berths. 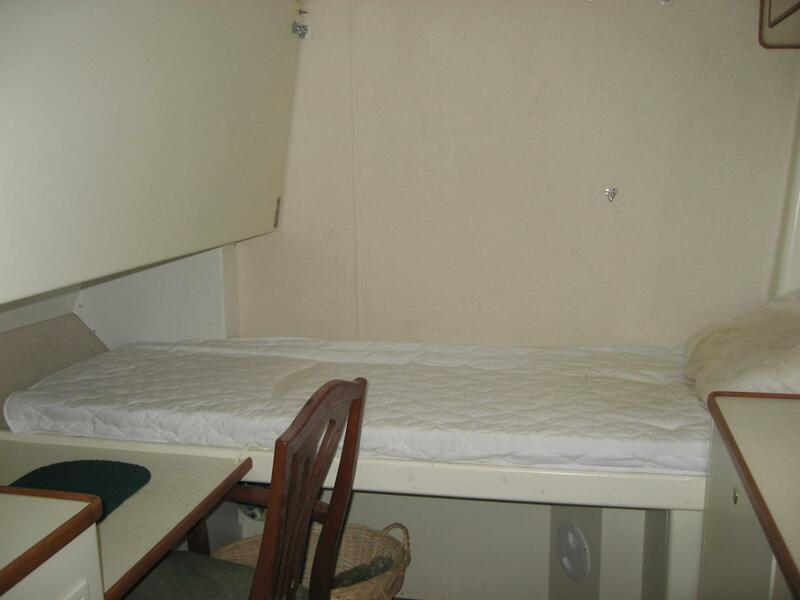 Separate toilets and showers are located off both companionways accessing the forward cabins. The toilets are ventilated by port lights and the showers by hatches in the overhead. Cabinets provide a dry place for towels and clothes when taking a shower. 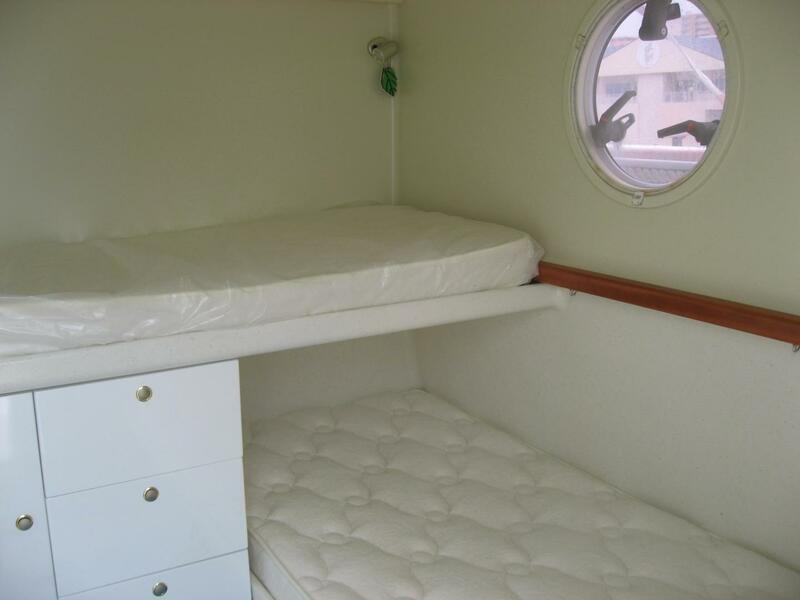 Aft of the port shower compartment is a small mid cabin with one fixed bunk athwartship and one pull down berth fore and aft. 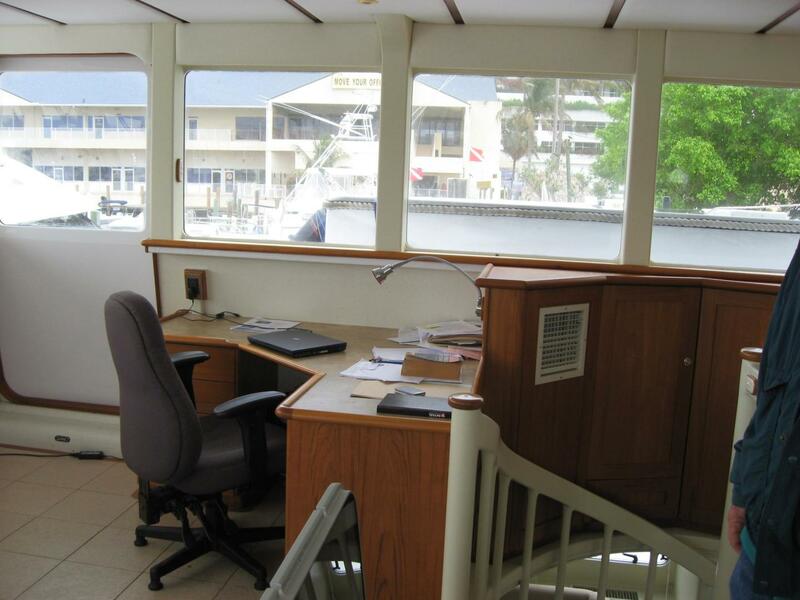 This cabin has two (2) port lights above a bank of outboard cabinets and a small writing desk inboard below the pull down berth. 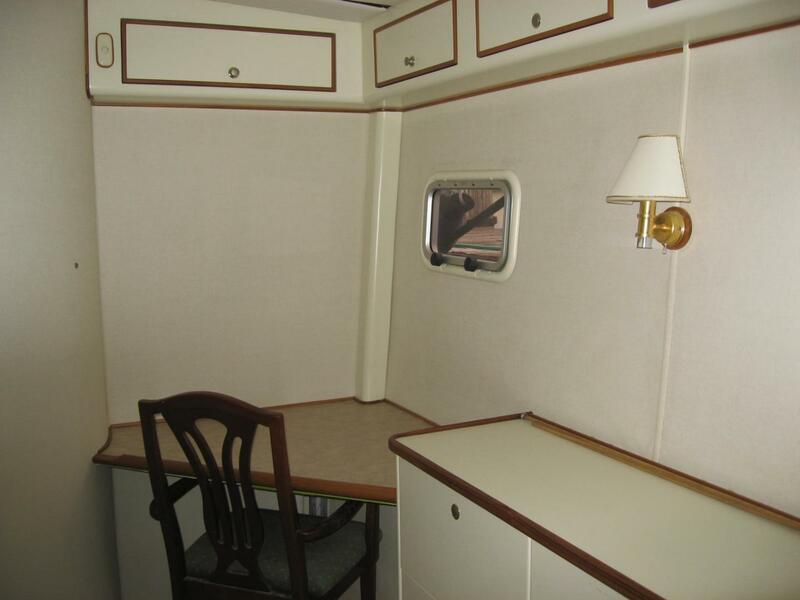 A privacy curtain closes off access from the companionway. The helm station is one level above the salon and is accessed by a spiral staircase off the entry foyer. The atmosphere is businesslike and dominated by an attractive, well organized console in rich teak spanning the forward bulkhead. Three sides are enclosed by large windows allowing excellent visibility. Three sliding doors open to wing decks port & starboard and to the mid aft cockpit. The room is quite spacious (15 x 15 ft) and in addition to the teak console is furnished with a desk, a table, four cabinets and one bookcase also in teak. 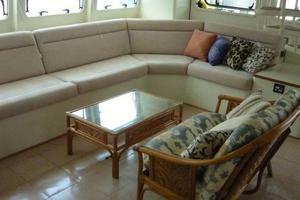 One upholstered settee and four upholstered chairs complete the furnishings. DC monitor / ckt. Bkrs. P&S depth sounder selector sw. 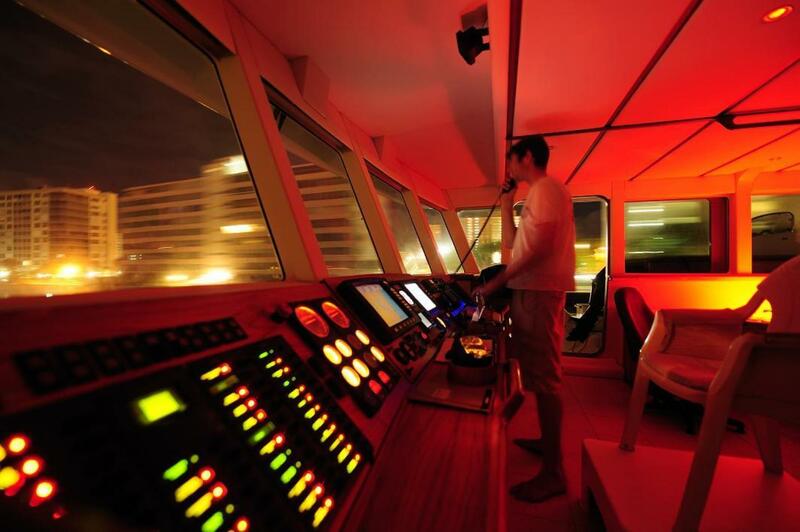 Proceeding from the pilothouse aft leads to the middle cockpit and adjoining crew quarters. 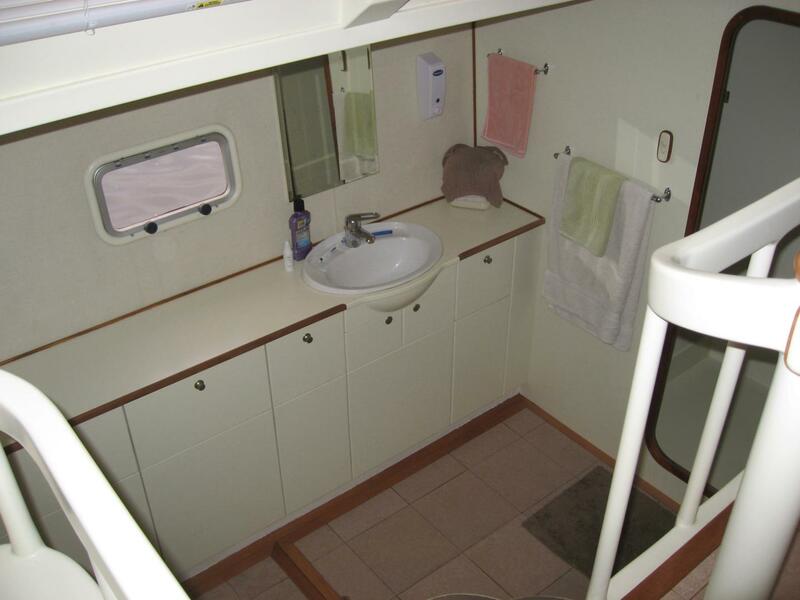 To port is a toilet compartment complete with sink and pull out shower. 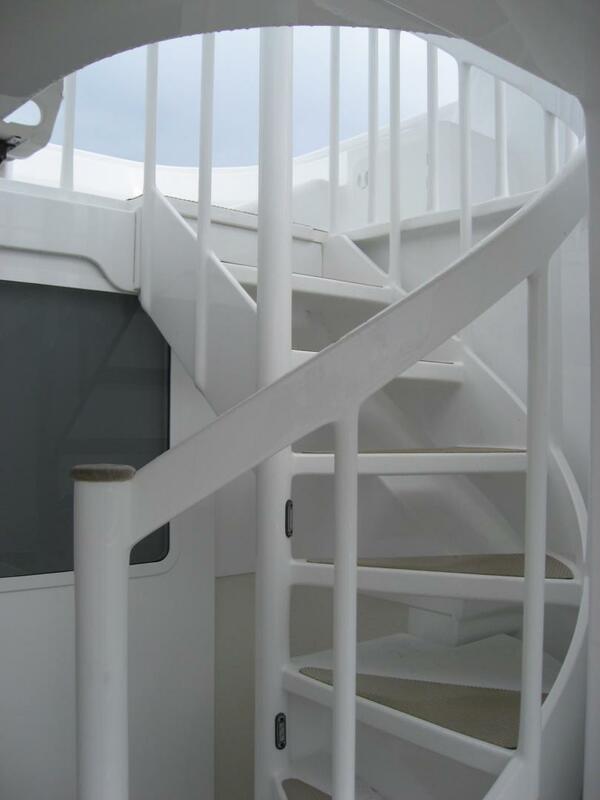 Inboard is the spiral stairwell leading to the flying bridge above. Further aft is the laundry area equipped with heavy duty Maytag washer and dryer. Another few feet beyond is the middle open cockpit and a small crew cabin which has two (2) single berths inside. The somewhat isolated cockpit atmosphere provides a quiet place for crew to relax apart from other activities that may be going on elsewhere on board. 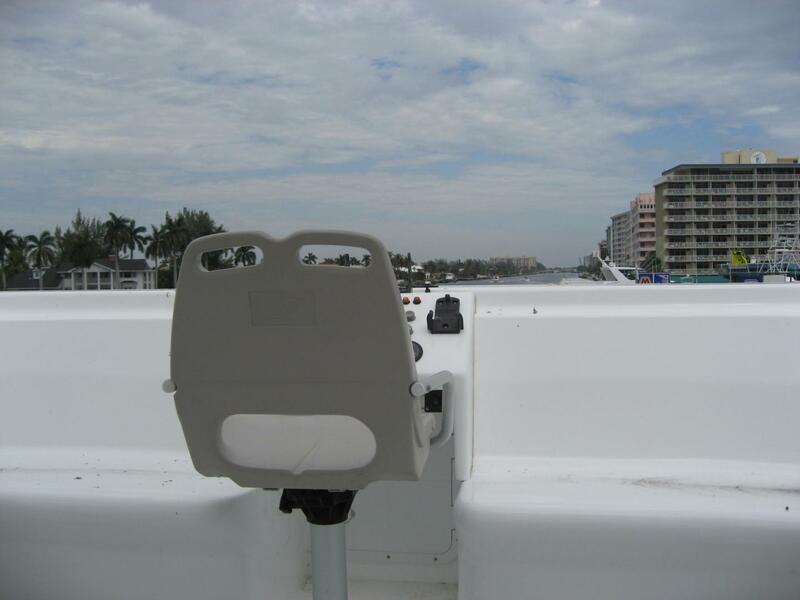 The flying bridge is equipped to operate as a second helm station with unrestricted visibility. The portable Morse throttle controls plus the Simrad WR20 remote autopilot provide flexible capability to drive the boat even while looking aft from the upper aft cockpit. 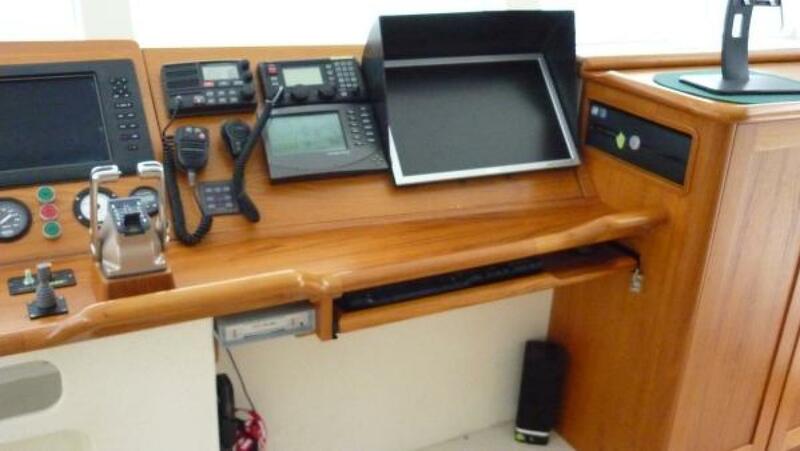 A removable Standard Horizon CPV350 chartplotter has an integral VHF with all functions as the main helm, including PA, foghorn, and digital selective calling. 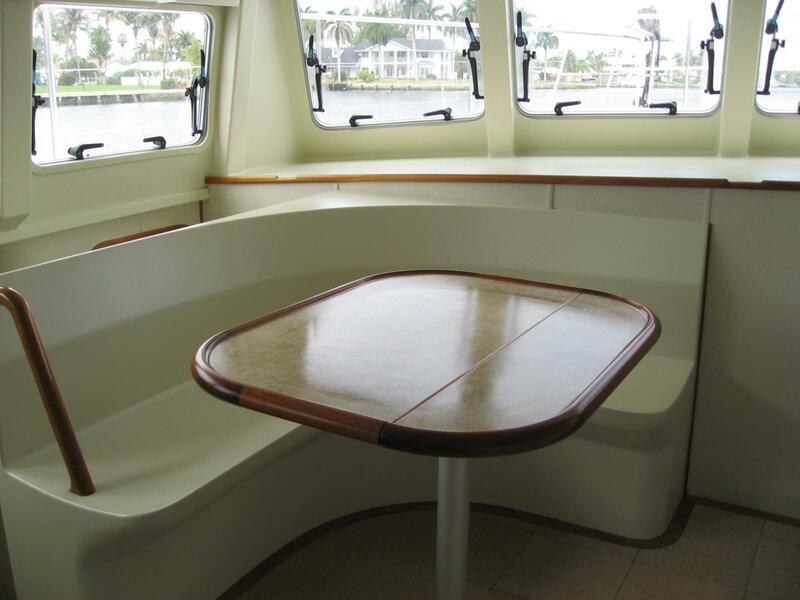 The flybridge cockpit can easily seat half a dozen guests with room to spare. 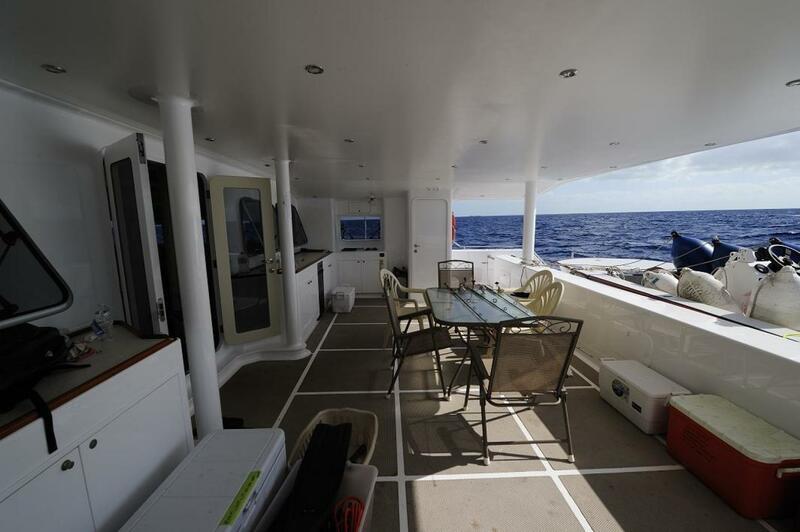 The huge foredeck area is two or three times that available on a typical 80' mono-hull, and is a great place for sunbathing and lounging. 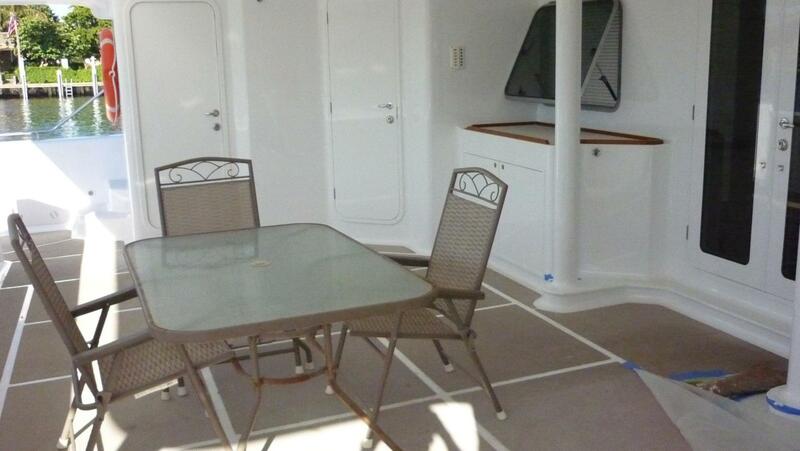 The decks are painted in a pleasing light gray polyurethane with non-skid additives. A center nacelle encloses two 180lb Manson CQR anchors housed in stainless steel chutes complete with horizontal rollers and chain lockers. Handheld push button controls operate the hydraulic-powered windlasses which are mounted out of sight inside the chain lockers. A deck handheld windlass control allows one person to retrieve the anchor while the captain concentrates on driving the boat. One hydraulic-powered capstan is centrally located on the main foredeck and can be controlled either by hand or foot-operated push buttons. A tie-off bollard is located nearby. A complete 24' Offshore Para Anchor system is stored in the starboard chain compartment along with bridle and anti-chafe straps. Stainless steel bridle attachment fittings are located on the inside bows and nacelle stainless fittings aid in retrieving a deployed Para Anchor. The middle foredeck is a few steps aft and one meter above the main foredeck and mounts (2) 12-man RFD Solas approved liferafts in fiberglass flatpacks. 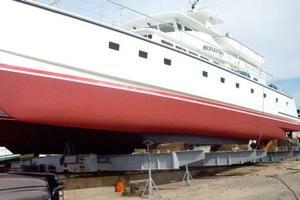 On the starboard side mid-level decks are two flats cat GRP tender boats and a 1000kg hydraulic-powered davit crane. 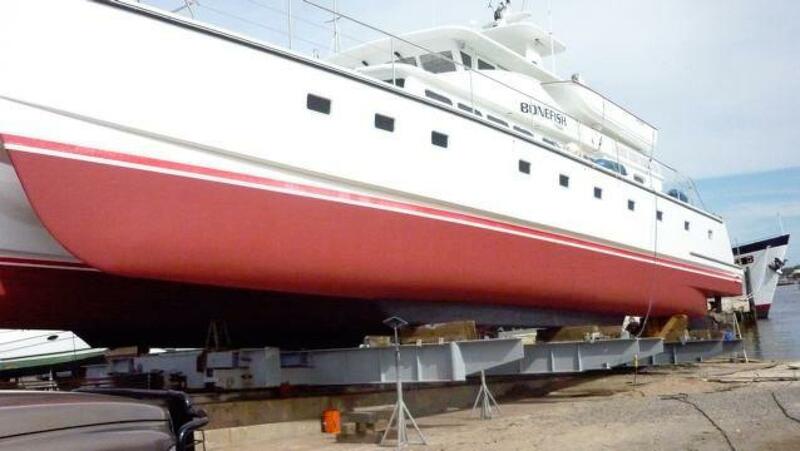 On the portside is one 18' GRP tri-hull tender and a second 1000kg davit crane. Both cranes are operated by handheld push button controls. A "Portuguese" coaming connects outboard from the tender boat support structure and curves around to the foredeck to provide secure access from the pilothouse. 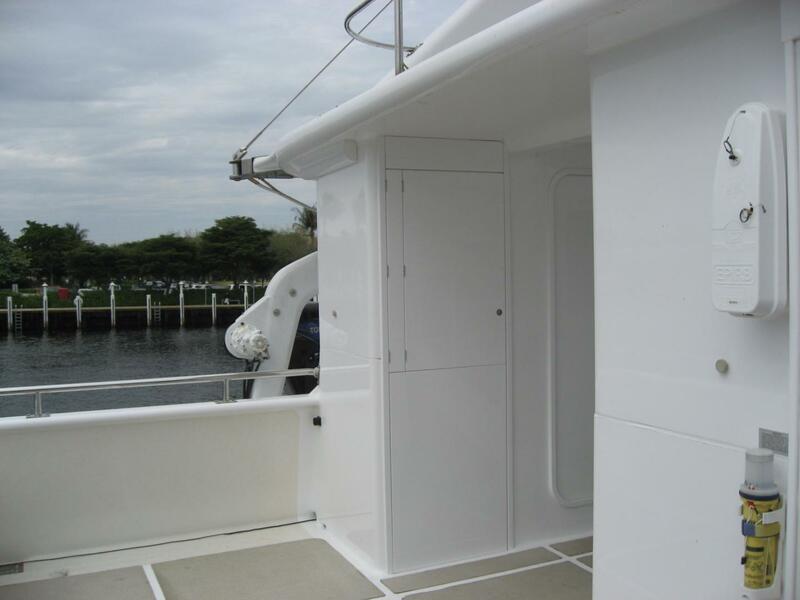 P&S boat support structures have built-in fishing rod lockers which are accessible from the main side decks. The boarding decks have opening gates on three (3) sides that allow several options for both dockside boarding as well as boarding and loading the tender boats. Two large deck hatches on each hull allow access to rudders, ground tackle, and additional storage. The aft compartments each have float sensors which alert the helm to water ingress. 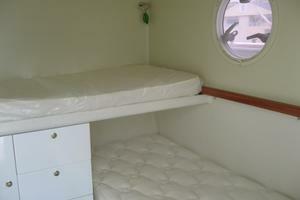 The aftermost compartments are also fitted with automatic bilge pumps. A 60lb Manson Supreme anchor is stored in the aftermost starboard compartment together with chain and rode. One hydraulic powered capstan operated by a footswitch is fitted on each aftdeck. 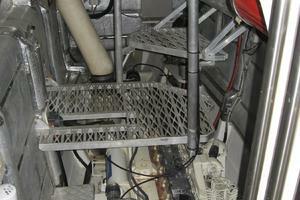 One GE freezer is located in the starboard after deck compartment. The engine rooms are accessed from the lower cockpit via weather-tight doors and stairwells with full headroom. The aluminium steps are hinged to swing up and out of the way when below, allowing better access around the engines. 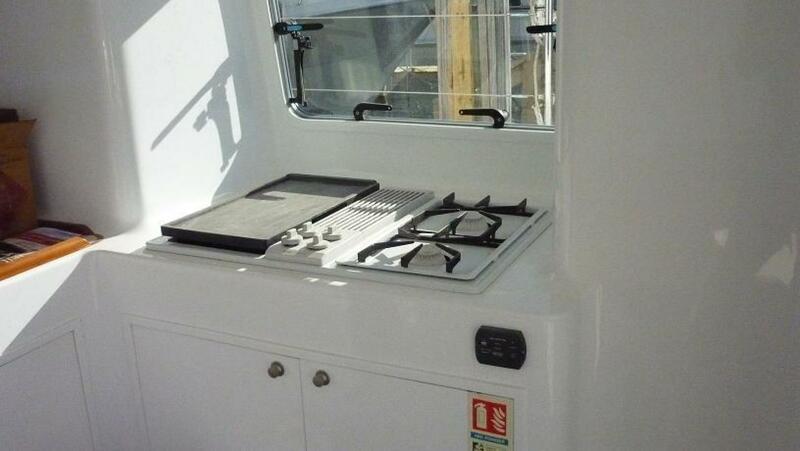 The port engine room contains the primary hydraulic pump and the hot water cylinder. Hot water is produced by both heat engine heat exchanger and electric heating elements. A tempering valve mixes the heated water to regulate temperature and avoid potential scalding. Redundant 1-inch fuel polishing / transfer systems in both engine rooms provide rapid fuel cleaning and transfer capability from any selected fuel tank and discharge into any fuel tank, including cross-hull. Both the polishing filters and the double primary engine fuel filters have electronic contamination sensors enabling constant monitoring and early warning to the helm. In line vacuum gauges in the engine rooms also monitor fuel filter condition. Redundant 175 amp 24v alternators are installed on both engines to charge the house batteries. Engine start batteries are supplied independently by 12v alternators. Both engines have 1.5 inch belt driven Jabsco fire pumps with cam lock fire hose connectors. These pumps also act as high capacity emergency bilge pumps to supplement the 24 volt automatic bilge pumps in the event of an emergency. 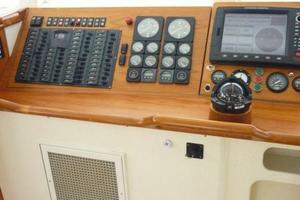 Bilge water levels are monitored and alarms activated at the helm if a problem arises. 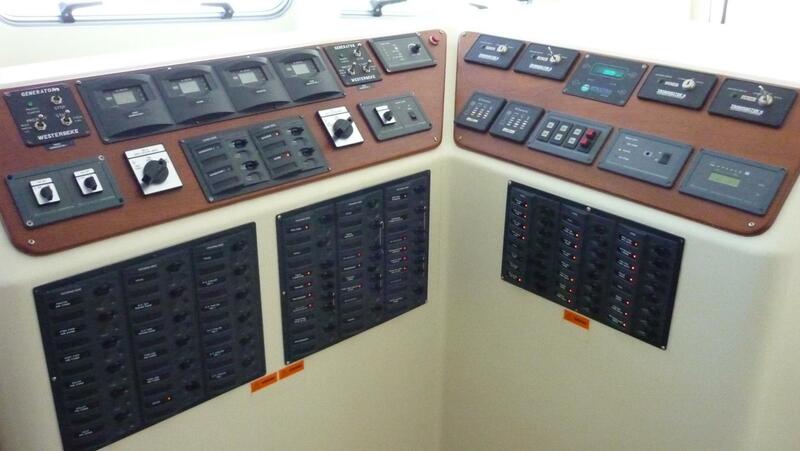 Both engine rooms have duplicate engine gauges and local control for start / stop. Fixed HFC-227 Fireboy extinguishing systems with automatic & manual discharge and remote alarms are in a place as well as hand held extinguishers. 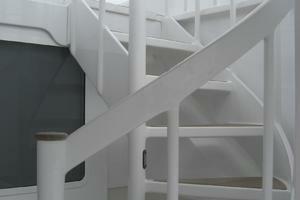 Acustop sound insulation ensures a quiet ship. Lighting is by 24v halogen watertight fixtures. The startup date for the 1998 Cummins engines was 2009. 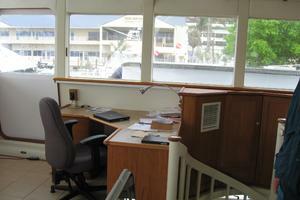 The shop is accessed from either the starboard engine room or from the double cabin off the dining room. Two (2) Westerbeke 10kw 120/240v 60hz gensets are enclosed in a sound insulated box that doubles as a work bench with a large vice at one end. Overhead there are built in tool cabinets stocked with tools required for on board maintenance. Outboard are the primary electric distribution panel, a 5kw Mastervolt inverter, a 100 amp Mastervolt charger, a 24/12 volt Mastervolt converter and the house battery bank, which is composed of 3 banks of 4 each 6 volt deep cycle lead acid batteries. Two additional 6 volt batteries form a 12 volt bank for electronics. Above the battery banks are cabinets for additional tools, spare parts and firefighting gear. 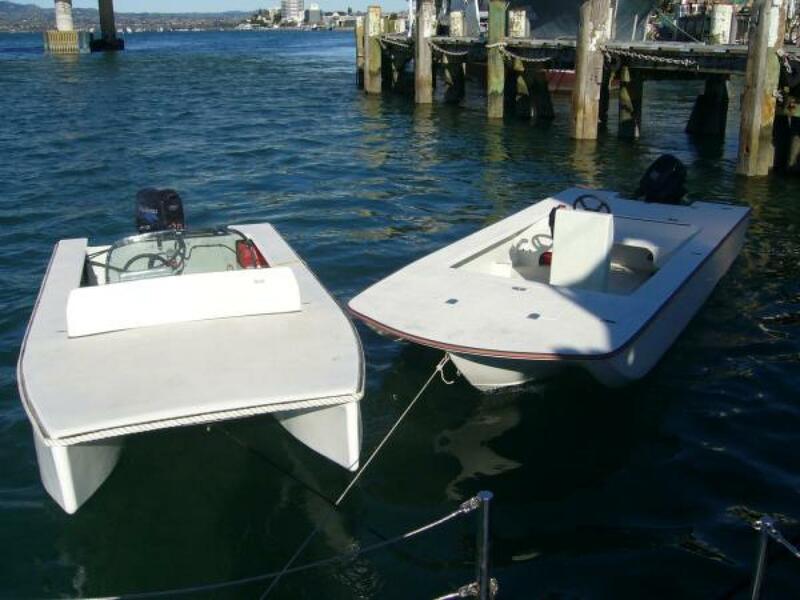 Inboard forward are the Marine Air chilled water modules and the Spectra 1000 watermaker. The electrical system is designed to comply with ABYC guidelines and is compatible with either 50hz or 60 hz shore input. 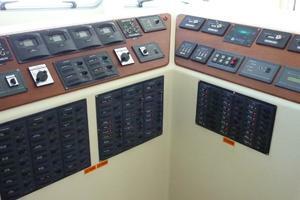 Shore power from either port or starboard connections is fed into the boat through a galvanic isolation transformer located in the starboard engine room. One lug inside the transformer requires changeover to go from 50 hz to 60 hz input. The Mastervolt charger will convert either 50 or 60 hz, 230 or 240v into 24 volt battery power. The inverter provides constant output in 110v 60hz regardless of the charging source input to the batteries. Engineered for total redundancy, the battery power source and be either 50 or 60 hz shore supply, either of the two gensets or either of the 175 amp auxiliary alternators on the engines. The air conditioning system will run on either 50 hz 230 v or 60hz 240v. AC electric control panels located off the dining room are divided into two busses, one for air conditioning and one for all other circuits. 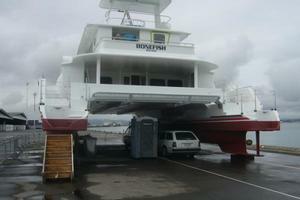 Either buss can be fed by one generator or by shorepower. The inverter feeds only 110v circuits. Wall outlets have two wiring circuits with receptacles for European 230v 50 appliances as well as American receptacles for 110v 60hz appliances. Four BEP multimeter monitors continuously display volts, amps, or hertz from the four possible AC supply sources. The DC panel is separate and has a Mastervolt battery monitor that continuously displays battery state, with alarms for low voltage and overcharge conditions. Cables are Lloyd's certified marine wire and are marked at both ends with alphanumeric codes. Drawings and cable schedules are on file showing as-built circuitry. The Operation Manual and Training Handbook will assist in management of this fundamentally safe system. The high capacity (1000 gal/day) Spectra watermaker will produce sufficient freshwater in only a few hours run time for typical daily use. It has an automatic flush cycle, Z-Brane filter protection, and a remote digital controller that advises when service is needed. Two stainless steel water storage tanks are provided; one is normally dedicated for daily use and one for reserve. Two X-Calibur XRS-124 pressure pumps provide system redundancy. The pumps run in parallel and can pick up from either tank. They are programmed to run sequentially so the 2nd pump comes on line when the demand exceeds single pump capacity. The run sequence can be reversed to prolong pump life. Water from shore passes through 3 Big Blue 10-inch filters before going into the storage tanks. A fourth Big Blue .5 micron cyst filter is installed upstream of the galley single sink. Primary water distribution is 1-inch PVC pipe; secondary is John Guest 20mm. Hot water lines are insulated. The Sealand vacuum system is similar to that found on commercial airlines, uses little water and is low maintenance. The upper head and the lower cockpit head share one vacuum generator; all others have individual generators. The vacuum generators are mounted on top of the holding tanks. The tank monitors and pump controls are located above the main DC electric panel. In restricted waters, the Tankmaster4 controllers are set to locked off position to prevent accidental overboard discharge. "Do Not Flush" panels in each toilet warn when the vacuum is too low to safely flush. The tank monitors and pump controllers are located adjacent to the black water controls above the DC electric panel. In unrestricted waters, the controllers are set to automatically discharge when the tanks reach 3/4 full and shut off automatically when empty. The system is low maintenance. One advantage of composite GRP construction is the utilization of closed cell foam in the sandwich construction. The R-factors depend on panel thickness but are better than wood of similar thickness, and incomparably better than either aluminum or steel. 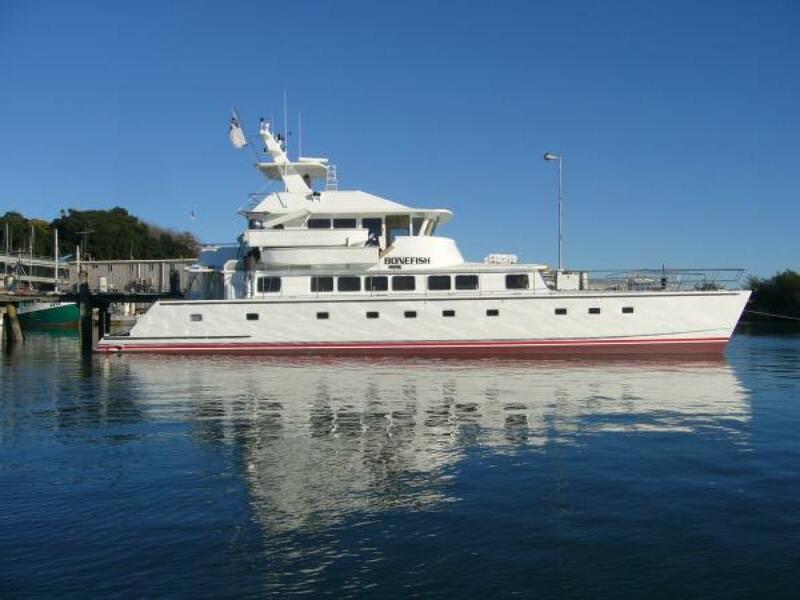 Natural cooling has been maximized by use of roof overhangs above windows, by large port lights in the hull topsides; by hatches in the lower cabins, by opening custom windows throughout the main deck and by sliding doors in the pilothouse and upper crew cabin. Except in very hot climates, air conditioning is seldom required. However, all accommodations except the upper crew cabin are equipped with individual temperature controls and air handlers. The system is designed to cool two zones: general accommodations in day time and sleeping accommodations at night, but not both at the same time. The chillers come on line sequentially as temperature rises or more air handlers are brought on line and automatically shut themselves off when room temperatures fall. The chillers are reverse cycle and provide heating in the winter season as well. One genset will handle the efficient system. Redundancy is an integral feature of the system design as evidenced by both duplicate steering pumps, and by duplicate (primary & auxiliary) main pumps. 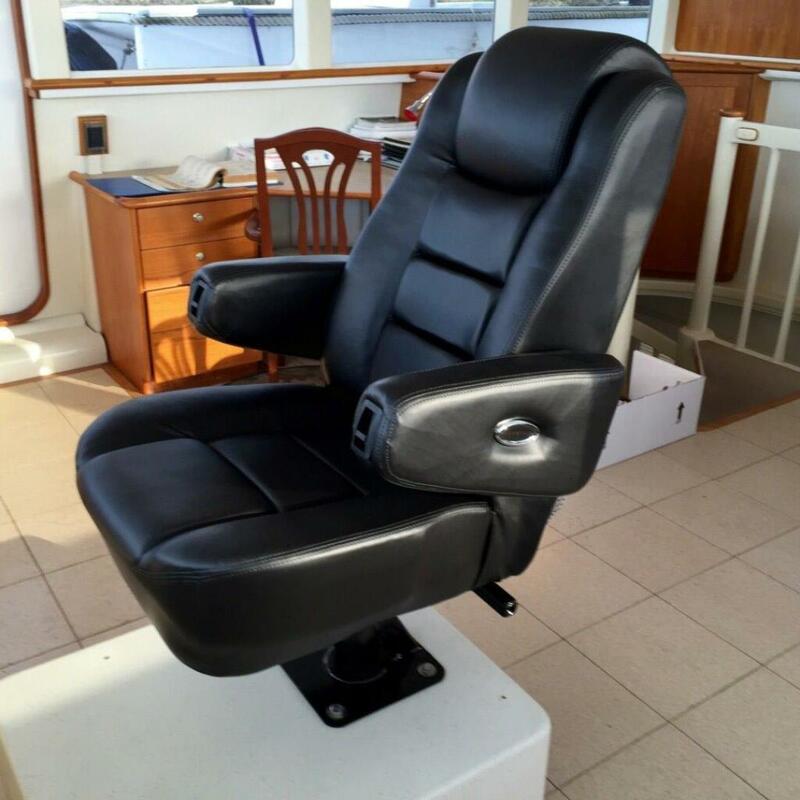 The steering pumps function automatically, with the exception of starboard single engine operation, which requires activation by a control switch at the helm. Normal anchor or capstan operation is preceded by engaging the primary port engine pump, with auxiliary pump available as backup. The transom elevator also normally uses the primary pump. The davit cranes are operated by the auxiliary pump with the primary pump providing backup. Changeover from primary to auxiliary pump is a matter of switching one valve located in the starboard engine room. The PLC (programmable logic controller) energizes appropriate manifold solenoid valves as pushbutton controls call for various actions. System operations and flow diagrams are covered in the Operations Manual & Training Handbook. Custom built stainless hydraulic rams that actuate balanced rudders are located in the aftermost hull sections and are hydraulically linked by crossover lines running through the transom. Autopilot steering uses only the port engine steering pump with a 10 second hardover to hardover rate. Joystick operation uses both engine steering pumps to achieve a 5 second hardover to hardover rate. 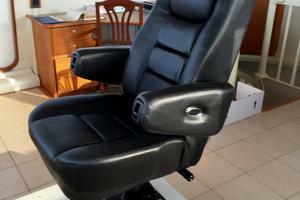 Either joystick or autopilot can function on a single engine pump, with flow rate restricted to 10 second hardover time. 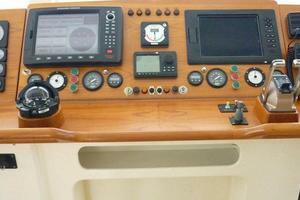 Rudder indicators at both helm and flybridge provide clear display of rudder angle. Periodic rudder realignment can be achieved remotely by moving rudders to starboard stops and pressing a circuit breaker marked "align rudder". Due to the wide distance between props, Bonefish can be steered quite well by engine power alone, with rudders centered. In the unlikely event both engines are simultaneously disabled, the auxiliary genset pump will provide emergency steering as well. Two 180 lb Manson CQR anchors are stored on rollers in the center nacelle with an all chain rode of 250 ft high test 1/2 inch chain for each anchor. Either anchor can be deployed from either helm or foredeck positions. Bronze chainlocks secure the anchors when stored or when deployed. Chain counters display length in meters as it passes through the windlass. In heavy weather conditions, a 1 inch nylon bridle transfers anchor load from the windlass to heavy stainless steel pins located on the forward bows. One 60 lb Manson Supreme anchor with a chain and rope combination rode is stored in the starboard aft deck locker. A backup nylon bridle and spare rode are stored in the port aft deck locker. The streamlined semi-displacement hulls produce low drag and are easily propelled by relatively low horsepower compared to other vessels of comparable size. Hundestad controllable pitch 4-blade props provide the helmsman with the capability to optimize propeller pitch to match any desired power setting, resulting in a more efficient fuel burn. Pitch control is exercised through heavy duty electrically actuated Hudestadt gear that move fore and aft a second shaft inside the main drive shafts. 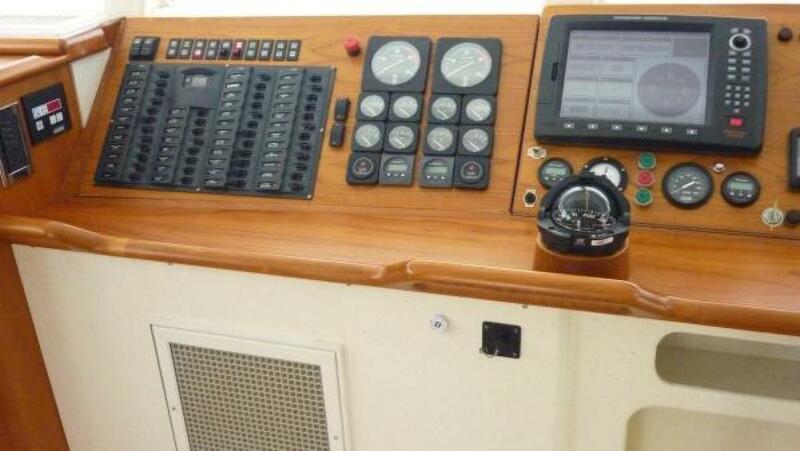 Push button controls and pitch display meters are located at the main helm. It is not necessary to change pitch when shifting into reverse, as the engines are equipped with conventional ZF transmission gear as well. The props are counter rotating. The efficiency of this system results in fuel consumption rates that surpass typical monohull consumption rates by a factor of 300 - 500% when comparing vessels of equivalent accommodations and speed. 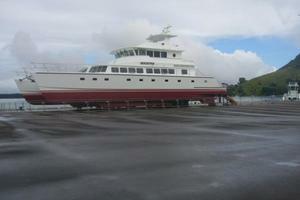 Four GRP tenders ranging in size from 15 to 18 feet are carried on deck. 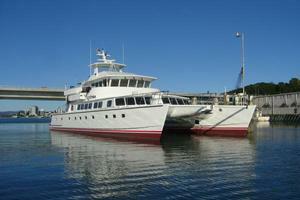 The two larger tenders are tri-hull configuration; the smaller two are catamarans. All are high-tech foam composite construction and have sufficient internal flotation to remain afloat even if swamped or inverted. 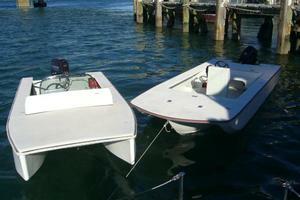 Three are powered by 30hp Tohatsu 4-stroke outboards and one by a 36hp Yanmar diesel outboard. 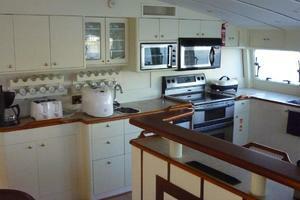 All have flush foredecks, walk around side decks and center consoles. Three have consoles which fold down when stored. The smaller flats cats also have fold down windscreens. All are equipped with anchors and life jackets. 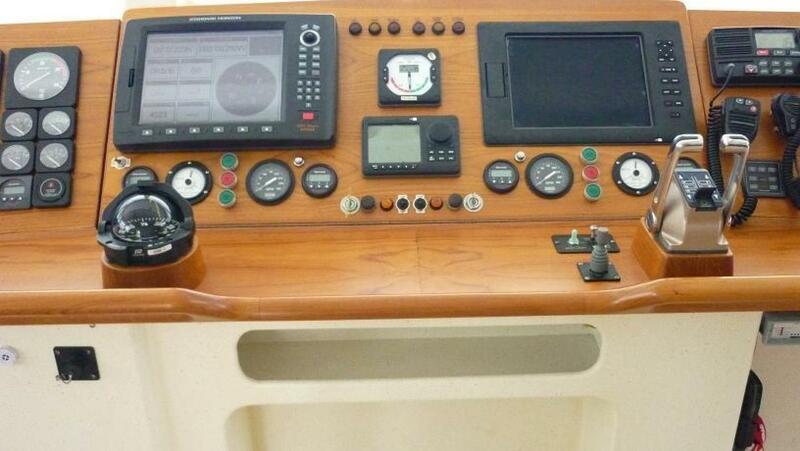 The diesel-powered tri-hull is also equipped with a Standard Horizon CPV350 chartplotter / sounder / VHF package. 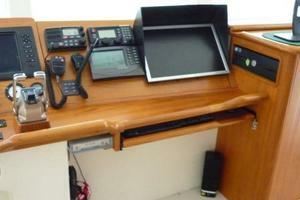 The other three tenders have hand held Standard Horizon HX850S VHF radios with internal GPS and DSC capability. 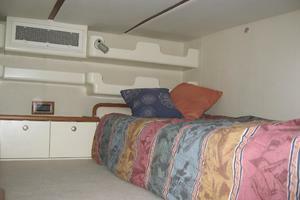 Two watertight crash bulkheads are built into the hulls forward of accommodation areas. 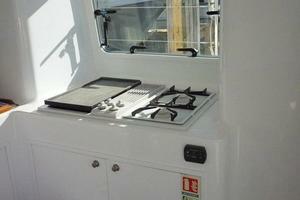 Further aft, the hull sections below the forward cabins are also subdivided into watertight compartments. 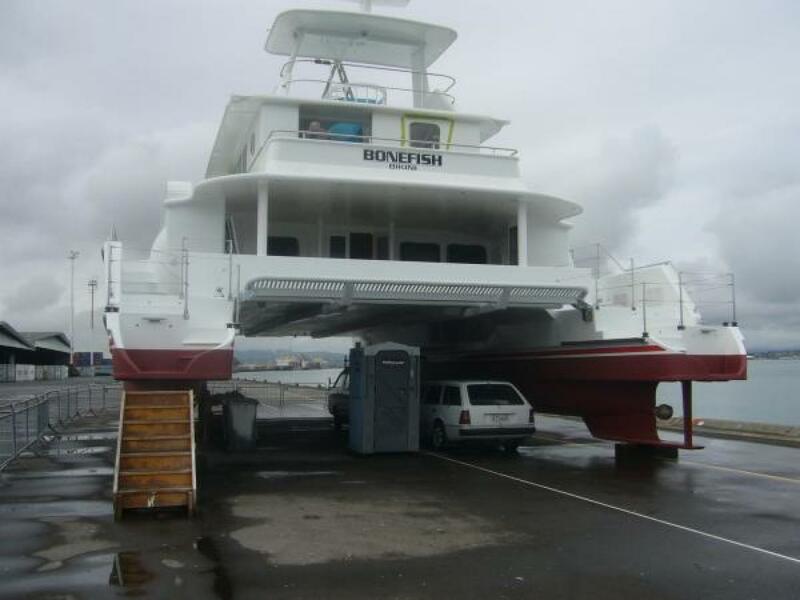 By virtue of its composite construction, Bonefish would remain afloat even if holed or inverted, due to approximately 25 tonnes of positive displacement provided in the internal closed cell foam between the laminates. 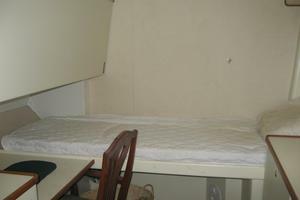 All accommodation areas have two or more alternative exits in case of emergency. 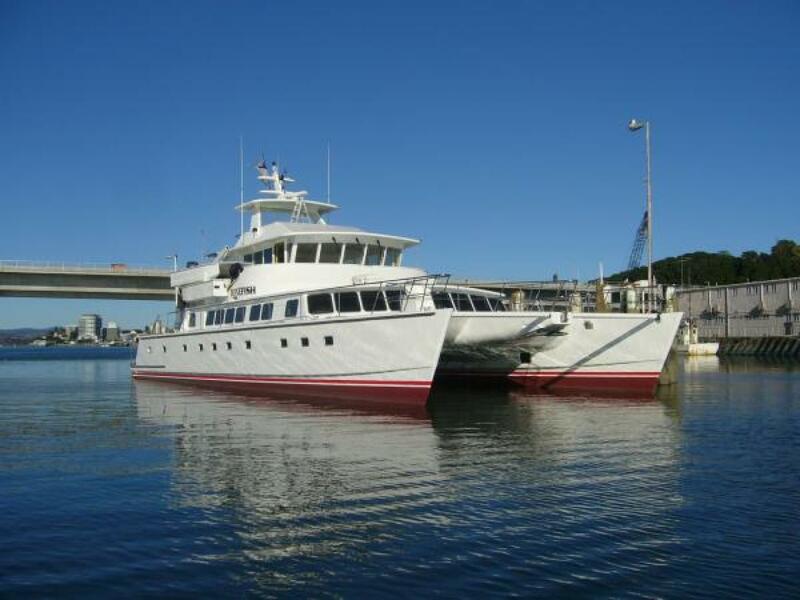 The vessel is designed, constructed and tested to class 1A1 HSLC RO YACHT structural standards of Det Norske Veritas and electrical & mechanical standards of American Bureau of Yacht Standards. It is registered and maintained as a private yacht under Marshall Islands Maritime Regulations which are recognized both by US and worldwide maritime authorities. Structural laminate testing was done by High Modulus New Zealand Ltd. and the Auckland University Mechanical Testing Laboratory to confirm compliance with design requirements and DNV regulations. Pressure testing of the custom windows was done by the window supplier under DNV supervision and approval. Survey to Fitness is by the International Yacht Bureau. 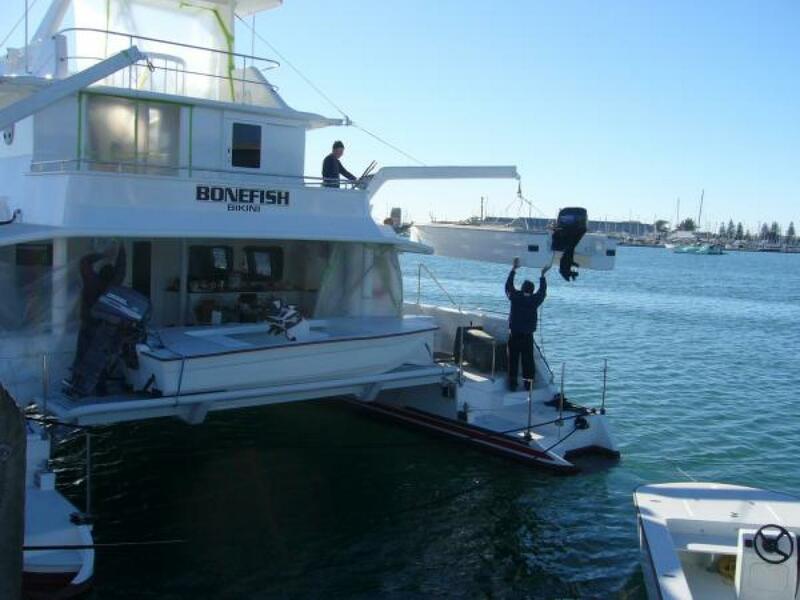 BONEFISH is truly a custom yacht. 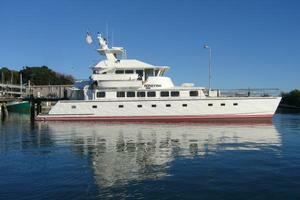 Her owner refined and improved the basic design over a 10 year period as construction progressed. 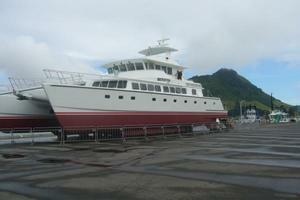 The result is certainly one of the best thought out and well engineered yachts in her size range. 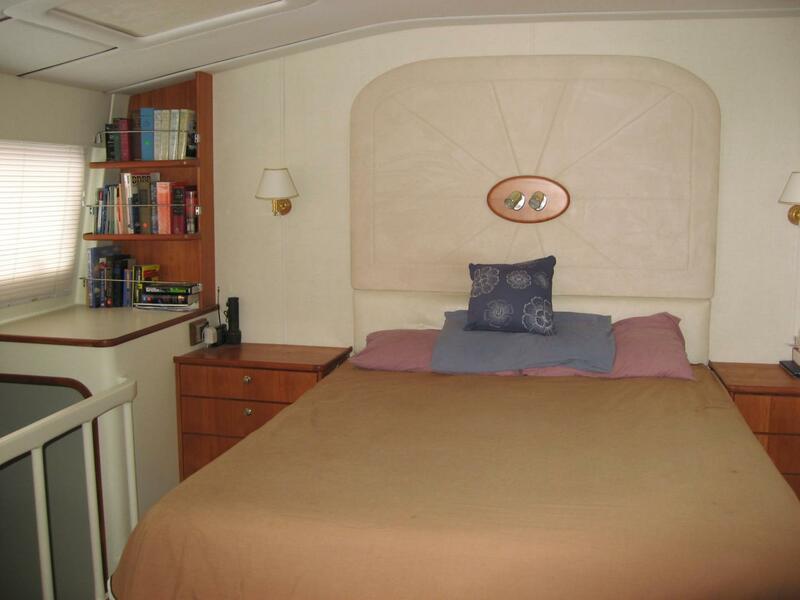 The wide beam not only provides excellent stability but also accommodations equal to a 120 foot monohull. The inherent catamaran fuel efficiency is further augmented by controllable pitch propellers, giving unsurpassed fuel efficiency for a yacht with such spacious accommodations. BONEFISH recently crossed the Pacific West to East under her own steam where both her design and fuel efficiency were again tested and confirmed by the forces of nature. The voyage was made without mishap at 8 to 10 knots average speed against both wind and current while averaging better than 1 nautical mile per gallon. While every effort was made to list all pertinent included equipment, personal belongings on board such as fishing tackle and other gear not specifically mentioned are excluded.